When developing a panel of experienced women for our “Women in NextGen Manufacturing & Engineering” forum, we knew that Kay Rand was more than qualified. Rand serves as the Sector Vice President of Mission Assurance for the Electronics System (ES) sector. She will bring a wealth of knowledge through her extensive education and work experience to the March 27 event. As Sector Vice President of Mission Assurance for the Electronic Systems (ES) sector, Rand has responsibility for the development and implementation of all Mission Assurance programs and processes across the sector, including quality assurance, risk management, independent reviews and assessments, and such process-improvement initiatives as Six Sigma and Lean Manufacturing. Rand received a bachelor’s degree in mathematics from James Madison University, a bachelor’s in electrical and electronics engineering from the University of Dayton, and a master’s in technical management from Johns Hopkins University. In addition, she has completed the Executive Marketing Program at UCLA and the General’s Manager’s Program at Harvard University. 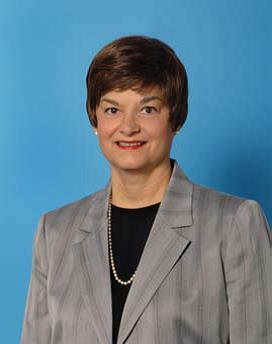 Rand currently resides in Severna Park, Maryland, along with her husband, Dan, and two of their four children. Next generation manufacturing depends on diverse strategies, new leadership styles and a background in STEM – Science, Technology, Engineering and Math. To remain competitive in the global marketplace, Maryland manufacturers need to know how to transform diversity into opportunity. This event offers a panel/audience discussion for anyone who wants to learn about successful women leaders in NextGenM . 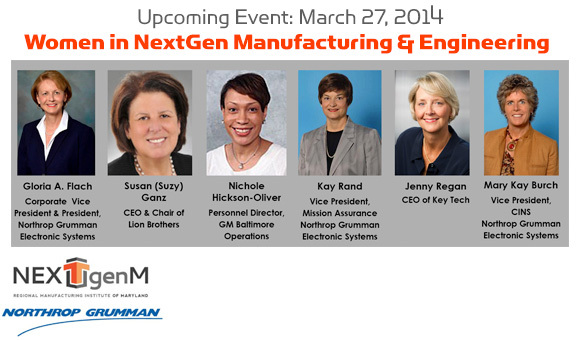 The event will be held March 27, 2014 from 8 to 11:30 a.m., at the National Electronics Museum (1745 West Nursery Rd, Linthicum Heights, MD 21090). The costs are $35.00 per RMI member and $45.00 for a non-member (membership info here) . RMI is giving students and teachers the opportunity to attend for free, but they must register here. For more information or sponsorship details, contact Mike Galiazzo at 410-771-8111. 9:10 -9:15 Today’s Program – Moderator – Mary Kay Burch, Vice President of Communications, Intelligence and Networking Solutions for the Land and Self Protection Systems Division of Northrop Grumman Electronic Systems, Member, RMI Board of Directors. ← Carver Vocational-Technical High School Launches CNC program to serve area manufacturers.